As surfing is so integral to the identities of surfers, I’ve been trying to find a way for this to be portrayed in interviews and have recently tested out a prototype quick fire interview with a twist. The interviewee will be the interviewer, and the whole thing will take place on a surfboard in the sea. The plan was to allow surfers the opportunity to answer questions in their element, and maybe catch some waves on the way. 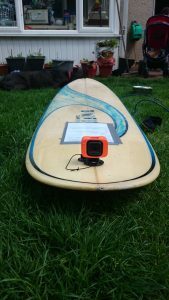 In attaching a GoPro camera and laminated question sheet to my surfboard, it was hoped that participants will paddle out on the board and answer the questions at their leisure. I decided that the camera should be placed on the nose of the board with the lens facing away from the participant; it is intended that this will allow for both an enhanced sound quality, and participant comfort; reducing the pressure that comes with being filmed. Knowing they don’t have a camera facing them may allow them to answer more freely. 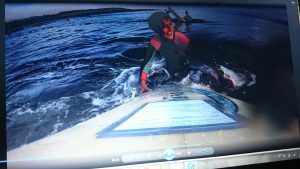 The questions will be placed close to where your head is when paddling, and will be open, but straightforward in nature. In the pilot schedule I have included 10 questions, but used a somewhat unconventional format. The first 7 have been pre prepared, with the final 3 asking the participant to talk freely around a theme/create their own question to answer. This will be discussed prior to the exercise and can be added with a permanent marker to the question sheet if the participant would like. This element has been added as a surfer, and potential participant, suggested that he would like to ask himself questions… as this is a pilot, a compromise has been reached and I’m excited to see how this part pans out. (this surfer has not been available again as yet). On location with the little board. So that was the plan. I’ve interviewed myself and it took me around 10 minutes and seemed to produce some nice imagery and sound recordings, in addition to the question answers. I have also roped in some friends to test it out which has been enjoyable and produced some interesting data. 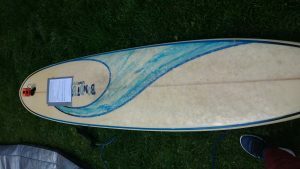 I am unsure how willing other surfers will be, so recruitment will be an issue. It will involve either pre selecting participants, through online groups or requests for example, asking people in the car park, or even paddling over to people and asking directly if they are interested in taking part. This will be the most convenient way as the participant is already in the water and will be easily identifiable as a surfer. 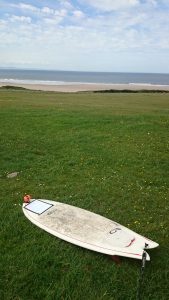 Surfers may be reluctant to swap boards or leave theirs on the sand, the interviews conducted so far though have been very quick (5-10 minutes) so if I am able to get this across to potential participants I may have more luck. Such short interview however also mean that while answers have been insightful, they are not comprehensive. The independence of the participant also means that no prompts or follow on questions can be asked. Perhaps a follow up focus group would help develop this. 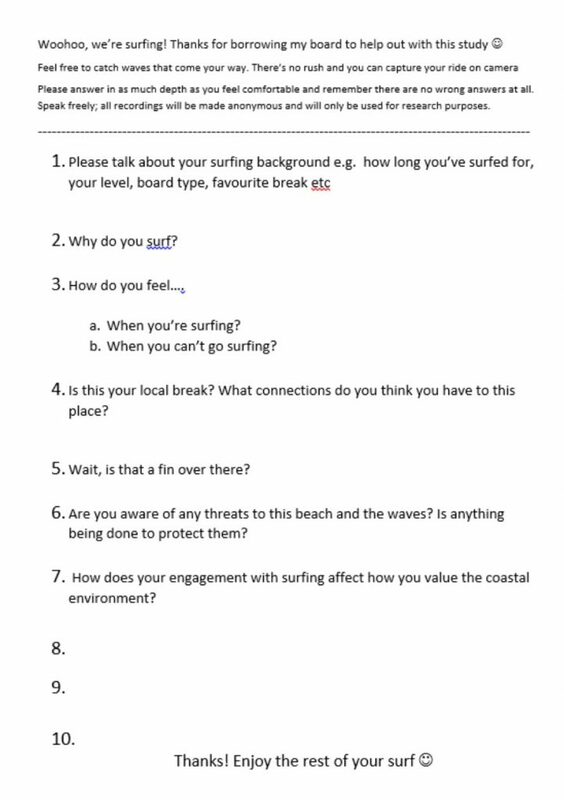 We’ll save that for another day though, and I’ll leave you with an excerpt from my 14 year old cousin’s interview, which he volunteered to get involved with during his first ever surf…..
MH: Please talk about your surfing background e.g. how long you’ve surfed for..
I’ve surfed for about 45 minutes to an hour. Uhh board type: one that floats. Favourite break: uhh I like lunchtime. Why do you surf? Uhh cos I don’t really want to drown. How do I feel? I feel great thanks. Oh, how do I feel when I’m surfing? Wet. Wet and umm wet. Other people: Matthew, paddle! Paddle! MH: Is this your local break? What connections do you have to this place? Umm, the connections I have to this place are the fact that I’m here, I’ve been here on holiday. I come here most years for the elvis convention. Maybe i need to work on those questions too eh.